1st - The Union throughout and in the centre the Royal Arms. 2nd - The Union throughout, and in the centre the Queen’s cipher. 3rd - (A Regimental sheet) of sea-green colour, which were the original facings of the regiment, and in the centre the Colonel’s arms. 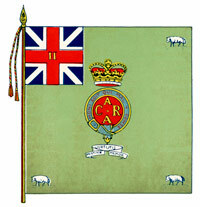 It would appear likely from this that the First and Second Colours were new Colours replacing those of 1686 (although there is no information on when or where these were presented) since by this time “The Union” referred to took in the cross of St Andrew on a blue ground, displacing the old green. 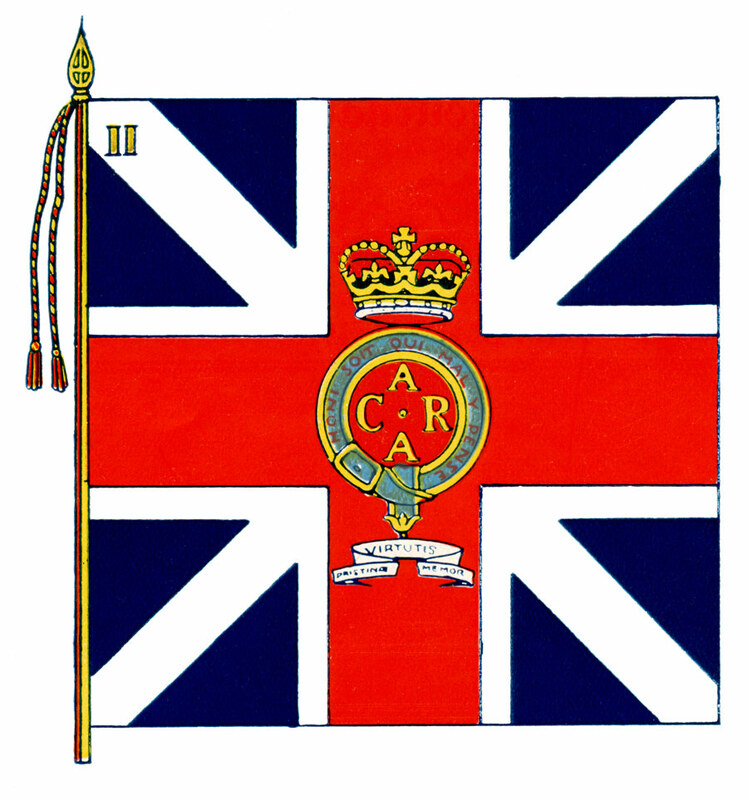 Also, Donkin says that the Royal Arms were in the centre of the first Colour and not, as in 1686, the cipher. It is, however, quite likely that the third Colour is the old Colonel’s Colour of 1686. 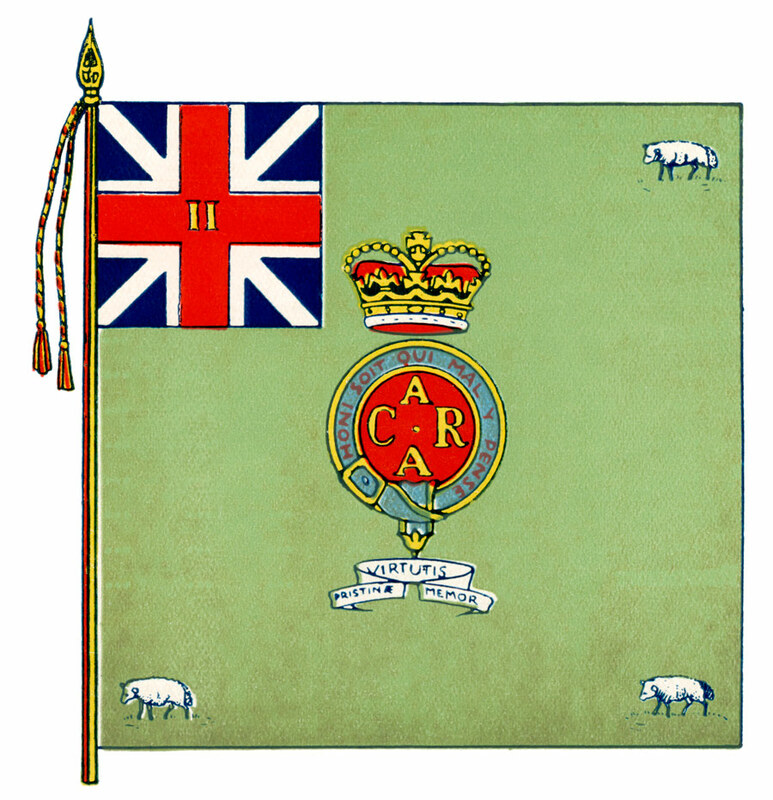 After the third Colour was removed in 1750 by General Fowke, then Colonel of the Regiment, the two remaining “Unions” continued in use until the following year when a Royal Warrant of 1st July 1751 authorised two new Colours for the Regiment. In the same year, a Royal Warrant had promulgated further regulations regarding numerals and distinguishing badges of regiments. As a result, these Colours, for the first time, displayed the lamb and were in service until 1768. 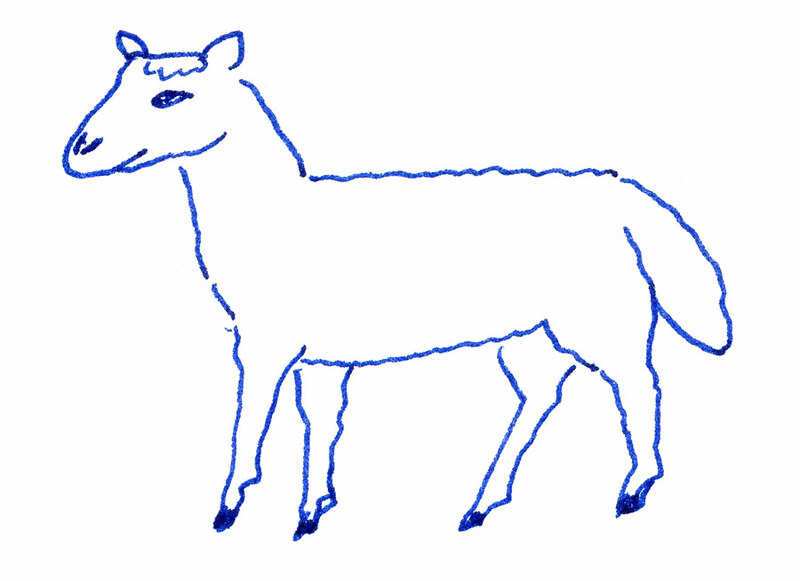 They are shown as figures 3 and 4, and the design of the lamb at this time as figure 5. The first appearance of the lamb on the Grenadiers' cap of 1715. 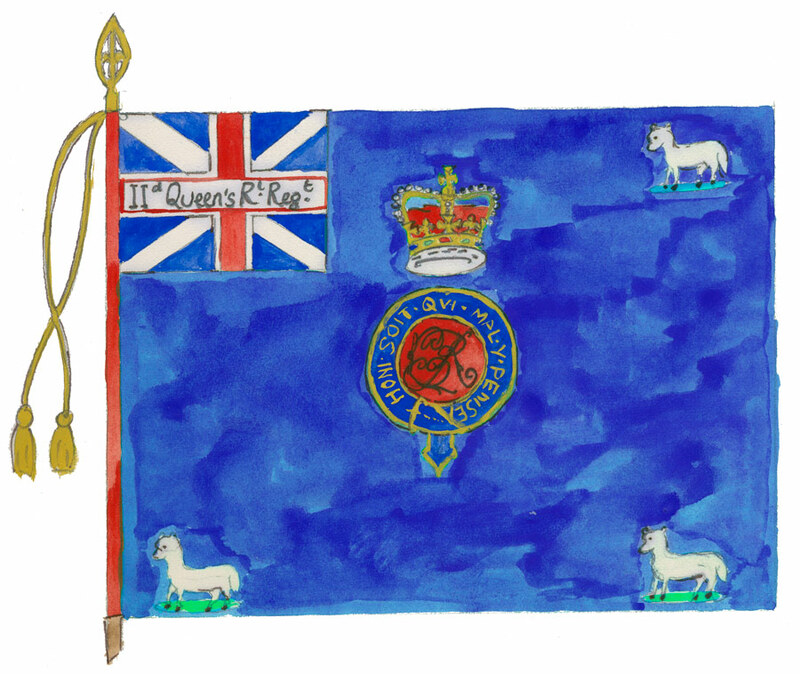 In this form it appears on the Colours until 1806. These follow the description given in the Adjutant General’s MS of 11th November 1747. 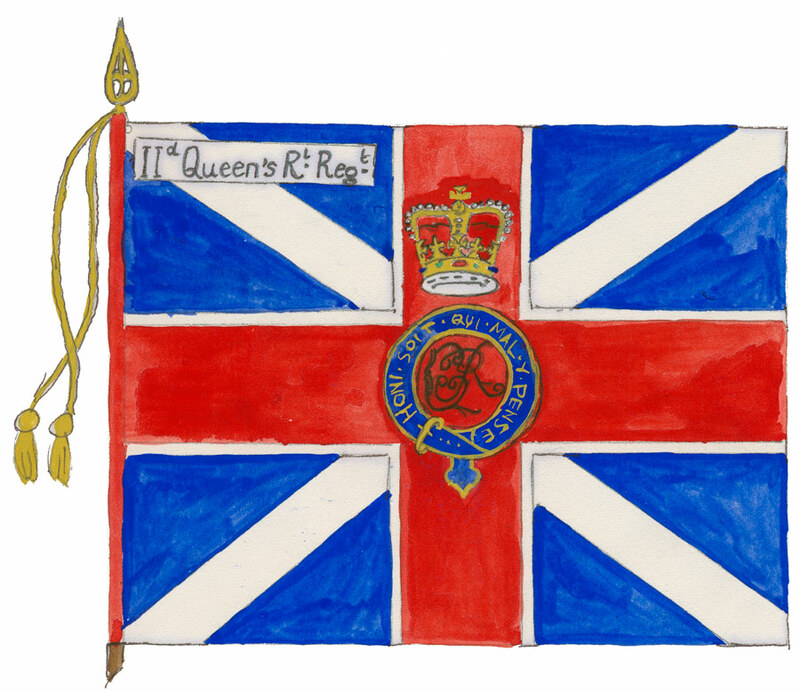 This ended the practice of any colonel displaying his own arms on his regiment’s Colours and regularised the design of Colours as the first or King’s Colour being the Union, and the second Colour being the Regimental Colour, of the facing colour of the regiment with the Union in the first canton, and bearing the regiment’s distinguishing devices. Details of numerals and distinguishing badges of regiments were codified; the size of Colours was to be six feet in length and five feet nine inches in height. Finally, all Colour pikes were to carry a spear point. In the case of The Queen’s, these devices were first, the Royal cipher. In the 1751 Colours, this was C A R A, (as shown in figures 6 and 7) which could refer to either “CArolina ReginA” – the present Queen – or CatherinA ReginA: it is unclear which. Secondly, the lamb, described as its “ancient badge”. In 1768 the Royal Warrant of 19th December, which again laid down further codification of regimental badges and distinctions, abolished the use of the green colour for The Queen’s and substituted royal blue. The Colours of The Queen’s therefore also changed although the general pattern of 1747/1751 was followed. 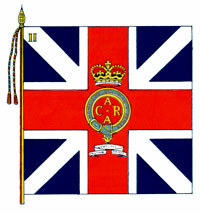 These Colours remained in service until 1772. First Colour. Note that the cipher has changed in design and the Regimental title now occupies the first canton.